A well-organized greenhouse will make plant care easy and convenient, and help you make sure you're properly caring for your growing plants. Shelving, hanging hardware and storage for gardening necessities are all critical to create an orderly greenhouse, whether you have a large and spacious greenhouse or a tiny one. Take the time to thoughtfully plan your greenhouse, just as you do your garden. Draw out your greenhouse on paper. Use one 12-square-by-12-square grid to represent each square foot of your greenhouse. Design a plan for your greenhouse based on its shape and layout. 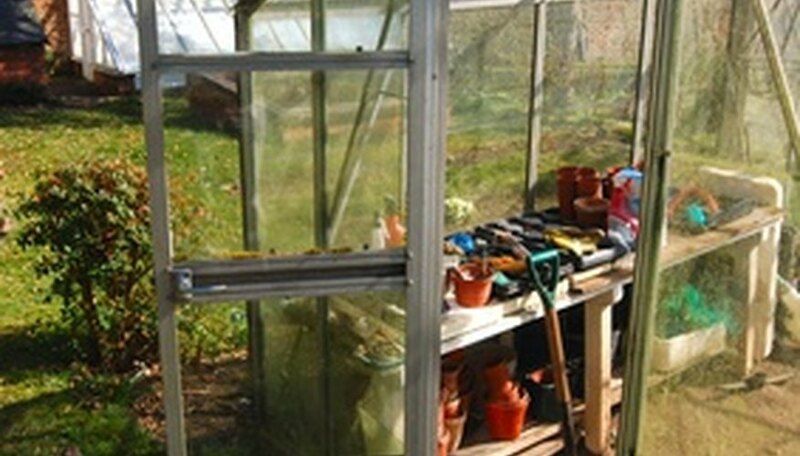 Include shelves or benches to fit lower and higher areas of the greenhouse. Decide if you have adequate space for multiple rows of shelving with walkways between them. Choose shelving or benches to fit your greenhouse. Use wood, metal or plastic shelving as you prefer. Opt for slatted shelving if at all possible to allow for adequate water drainage. Install lower shelves along the eaves of your greenhouse, then higher ones near the center. Allow at least 18 inches of walking room to one side or another of your shelves or benches. Create a work area near the entrance of your greenhouse. Set up a potting bench and separate tool rack, or purchase a bench with included storage. Store tools, watering cans and other supplies in this work center. Store pots, sealed bags of potting soil and other supplies under your greenhouse shelves and benches. If you have extra space and a mulch floor, consider planting salad greens directly into the ground to grow in your greenhouse. Be sure you can reach all growing areas in your greenhouse.